They had me at Lobster!!! 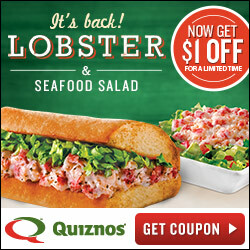 Print this $1 off Lobster sandwich coupon to make for a Thrifty lunch or dinner. which would make a lunch or dinner sandwich for under $6! When I printed my coupon it has an expiration date of 4/20/14; with one coupon, per person, per order. Previous articleGreen Leaf Patterned Shower Curtain On Sale $9.99 ~ Great Deal!